Be the first to share your favorite memory, photo or story of Shannon . This memorial page is dedicated for family, friends and future generations to celebrate the life of their loved one. 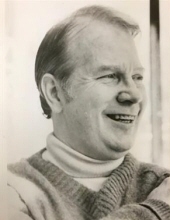 Shannon Stirnweis, 87, of New Ipswich died at home on January 20, 2019. Born in Portland, Oregon, he was the son of Ted Stirnweis and Daisy Daly. Survived by his wife Regina of 60 years having three sons: Kevin of Marblehead, MA, Kirk of Ft. Collins, CO and Eric predeceased and four grandchildren Shane, Cody, Cheyenne and Dakotah - two sisters Linda Ryan and Nancy Snowden of Phoenix, AZ. He was a member of St. Patrick's Parish in Jaffrey. Serving in the Army in 1954, he was stationed in Germany where he illustrated for the Army. Working as an Illustrator in NYC, he was President of the Society of Illustrators and one of the founding fathers of the Graphic Artists Guild. Shannon illustrated over 35 children's books as well as 3 books for Grumbacher Library, "The Art of Painting Dogs", "The Art of Painting Cats", and "The Art of Painting the Wild West". He recently published a book on his life as a painter, "80 Years Behind the Brush". He wanted to be remembered most for painting scenes of the American West. There will be a private family celebration of his life. In lieu of flowers, donations may be made Hospice. We shall all miss this kind, gentle soul with a great sense of humor. To send flowers or a remembrance gift to the family of Shannon Stirnweis, please visit our Tribute Store. "Email Address" would like to share the life celebration of Shannon Stirnweis. Click on the "link" to go to share a favorite memory or leave a condolence message for the family.